Author: Francois Fressin, Guillermo Torres, Jason F. Rowe, David Charbonneau, Leslie A. Rogers et al. Author: Thomas N. Gautier III, David Charbonneau, Jason F. Rowe, Geoffrey W. Marcy, Howard Isaacson, Guillermo Torres, Francois Fressin, Leslie A. Rogers, Jean-Michel Désert, Lars A. Buchhave, David W. Latham, Samuel N. Quinn, David R. Ciardi, Daniel C. Fabrycky, Eric B. Ford, Ronald L. Gilliland, Lucianne M. Walkowicz, Stephen T. Bryson, William D. Cochran, Michael Endl, Debra A. Fischer, Steve B. Howel, Elliott P. Horch et al. When staring at the transit light curves in the paper by Fressin et al. (which along with a companion paper by Gautier et al. are the subject to today’s astrobite), it hit me that these tiny dots are essentially the only clue we have that there are at least two Earth-sized planets are out there. They are just individual measurements of the brightness of a single, distant star, taken over the span of two years. But the tiny dips in the amount of light received – the dips are just 0.01% (100 parts per million) and must be identified on top of much larger systematic and stellar variability – paint the picture of a new solar system with five alien worlds, 950 light years from ours. On Tuesday, NASA announced the discovery of Kepler-20e and f, two very small exoplanets orbiting the star designated Kepler-20. That makes the Kepler-20 system home to 5 planets: three planets with radii 2-3 times Earth’s and the two smallest planets to ever be discovered, Kepler-20e and Kepler-20f. Kepler-20f has a radius just 3% bigger than Earth’s while Kepler-20e is smaller yet, at 0.87 times Earth’s radius, or roughly the size of Venus. Even with 10% errors on their sizes, these planets are assuredly Earth-sized. But Kepler-20d takes only 20 days to complete its orbit and Kepler-20e is closer yet – a year on this planet lasts just 6 days. 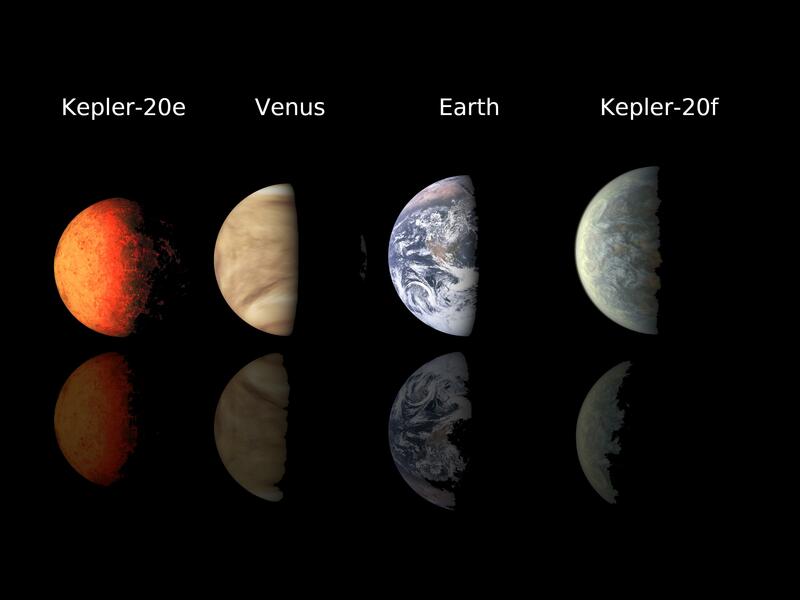 The newly discovered exoplanets Kepler-20e and f, compared to Earth and Venus. Based on models of planetary interiors and planet formation, these two small planets are believed to be rocky. They are too small to have retained a hydrogen gas layer (one of the scenarios that complicates interpretation of super-Earths). At most, they could have formed with an outer water layer comprising several percent of the total mass. Earth-sized Kepler-20f could have retained this layer but the stellar radiation relentlessly beating down on the close-orbiting Kepler-20e would have evaporated any water reservoir it may have had. There are two oddities about this system of 5 closely packed planets: their spacing and their ordering. In our Solar System, the planets are widely spaced; Kepler-20’s orbit much closer to their host star and closer to each other. Our planets are also neatly ordered: small, rocky planets closest to the Sun, large, gas giants outside the asteroid belt and the ice giants beyond those. Kepler-20’s are a mixed bag. The tidy segregation of planet types in our Solar System can be understood by considering two properties of the protoplanetary disk, the disk of gas and dust out of which the planets formed: first, how the density of the disk varies with distance from the star and second, the amount and type of materials available at different distances from the star. The architecture of the Kepler-20 system is markedly different from that of ours. Rather than being segregated by size and composition, the planet ordering alternates between large and small, gas and rocky. Starting from the star and moving out, the planet are in the following order: super-Earth (Kepler-20b), Venus-sized (e), sub-Neptune (c), Earth-sized (f), sub-Neptune (d). And all of the Kepler-20 planets orbit closer to their star than Mercury does the Sun. The jumbled configuration of the closely-packed Kepler-20 system is quite bizarre and can’t be rectified with the traditional understanding of planetary system formation. In the standard models, there isn’t even enough material to make the Kepler-20 planets at their current locations. Exoplanet discoveries such as this one, are helping us to realize that planet formation was a more dynamic and chaotic process than we previously realized. This means two things for the Kepler-20 system. First, the planets had to have formed farther away from their star and later migrated inwards. Second, some of them likely swapped positions during this process. While this isn’t by any means the first evidence for planet migration or orbit switching (see, e.g. hot Jupiters and other Kepler systems with multiple transiting planets, including Kepler-11), it is a very interesting puzzle for those studying the formation and dynamics of planetary systems. It also means that Earth-sized Kepler-20f may have spent a long period of time in the habitable zone of its star. The properties of the Earth- and Venus-sized planets in the Kepler-20 system (tiny but orbiting very close to their host star) make them a wonderful counterpart to another recent Kepler discovery. Just two weeks ago, NASA announced Kepler-22b, a super-Earth planet orbiting far enough from its Sun-like host star that liquid water has a chance of existing on its surface. Kepler-22b remains the only potentially rocky planet that’s been found in the habitable zone, but it’s really too large to be a good match to our Earth. On the other hand, Kepler-20e and f are similar in size to Venus and Earth respectively and are assuredly terrestrial in nature. But, they orbit too close to their host star for liquid water to have a chance of existing (although since we think the planets migrated inwards, a couple billion years ago we could have been in luck!). In concert, the discoveries of the Kepler-20e and f planets and Kepler-22b demonstrate that we are capable of finding a planet like Earth. One can view these two discoveries as milestones, steps towards the yet-undiscovered true Earth twin. But how will we actually know when we find a twin to Earth and how picky are we going to get? We’ll start by finding an Earth-sized exoplanet in the habitable zone. Then we’ll delve in to studies of its atmosphere, find a far different chemistry and wait for a new planet – one with, say, Earth-like abundances of carbon dioxide – and call it Earth’s twin. One could go into endless detail looking for “Earth’s twin.” But what’s the first thing you think of when daydreaming about other Earths? It’s size, and Kepler-20f is the first Earth-sized exoplanet. Amazing find! I am extremely excited even if they are too close to their star for liquid water – they EXIST and we have the ability to find more! That is incredible enough.